A self-adhesive sealing bitumen strip which bonds instantly to provide a permanent watertight seal in all climates. Primer 52679 recommended when applied onto dusty or porous surfaces such as bricks or concrete. Evo-Stik Flashband 100mm x 10m is rated 4.8 out of 5 by 76. Rated 4 out of 5 by Anonymous from Great product! 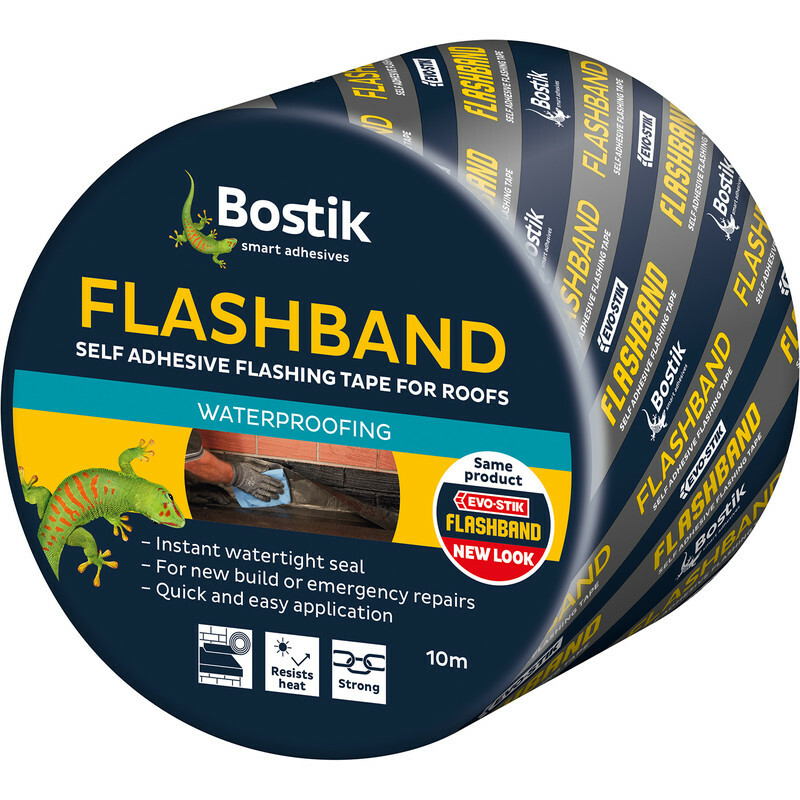 I bought this flashband to try making a temporary repair to the felt roof on my summer house until I could do a re-felting job later in the year. I used the flashband along the overlaps and nails of the felt. Being a novice there were a couple of things that nearly caught me out! 1. The backing paper is pretty flimsy so I had to lift the flashband slightly to ensure all the backing paper had been removed. 2, The first rain after using the flashband there were still a couple fo drips into the summerhouse. I found a small 4 inch roller in my wife's crafting materials and ran it along the edges of the flashband with as much force as I could. Pleased to say that this has fixed the leaks and it should, hopefully, keep the summerhouse dry until the summer. Did the job I bought it for but may not have been the right stuff!!! Easy to cut and fit and made for quite a neat looking finish. Rated 5 out of 5 by Alimack from Fantastic Product Great example of a roll of flashband to use to do a temporary repair or depnding on what your putting it on, a more permanent fix. Good price. A word of warning, needs a bitumen primer applied before hand to make sure it sticks well. Rated 5 out of 5 by Jenday from Excellent adhesion to surfaces Great product, good quality. Rated 5 out of 5 by Flexi from Does the job ! Poorly installed plastic conservatory roof leaked and leaked after many repairs. Flashband sorted it !